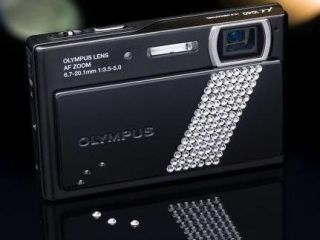 Olympus has teamed up with Swarovski to bring you a camera with added bling factor. Although the camera itself isn't new – it's essentially the Olympus mju 1040 – the model has been given a glamorous makeover, emblazoned with 98 Crystalised Swarovski Elements. While these do absolutely nothing to improve images, they do, ahem, improve your camera's image. The crystals themselves have been placed on the protective sliding lens barrier, so shouldn't impede in shot-taking. The Olympus Crystal comes with 3x optical zoom, shoots to a 10MP sensor, and has Intelligent Auto Mode. There's also face detection, so perfect for those with prosopagnosia. The Olympus Crystal 1040 will be out at the end of October for £175.